As an historic and important colonial-era river port, Wentworth has also been known as the 'Gateway to the Outback'. Founded as a river port in the early 1850s, it soon became the busiest inland port in Australia by the late 1870s. 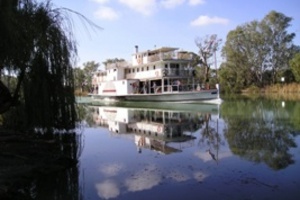 Today you can cruise the waterways on a riverboat tour, explore numerous sites associated with the indigenous Barkindji people and wander along self-guided heritage trails. Harry Narnya Tours also runs fascinating cultural excursions into the important indigenous areas of the region. The colonial era buildings of the town, including the Old Gaol and Customs House, are also testament to the township's ever-present history. Wentworth Pioneer Museum meanwhile has more than 3,000 exhibits including the fossilised remains of Australian mega-fauna and giant animals that became extinct around 20,000 years ago. For those keen to relax and enjoy the view of the Murray's rolling waters, Trentham Estate Restaurant is set on the banks of the river and features a menu of local produce.